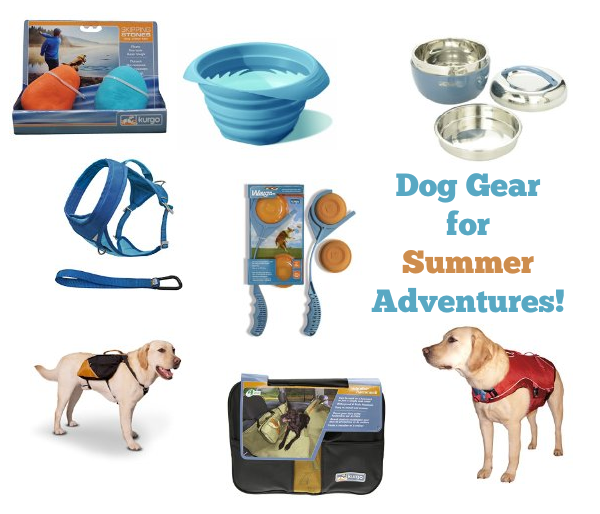 Summer is here and it’s a great time of year for some outdoor adventures with your fur kids! 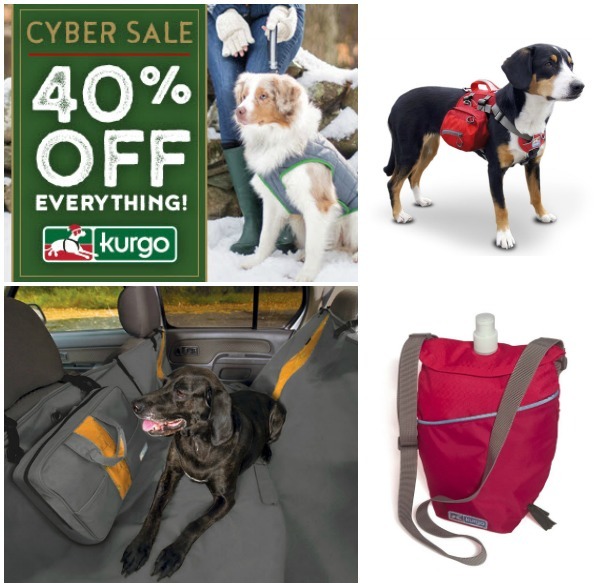 Dogs love to swim, hike and explore, and you’ll love the deals on quality adventure and travel gear for dogs from Kurgo. It’s getting pretty hot down here this time of year but we still love getting outdoors for a hike and a picnic with Daisy whenever we can! 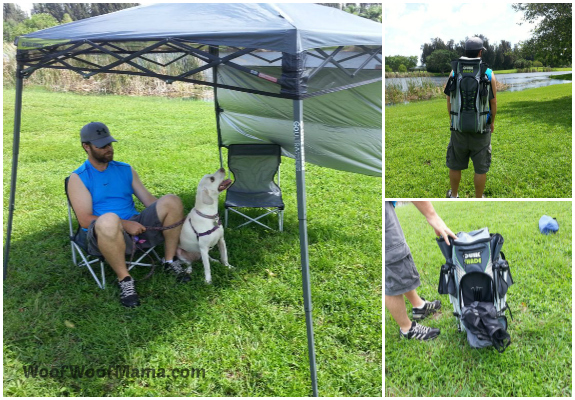 It’s been raining every day for almost 2 weeks, and we’ve already had our first tropical storm of the season, but yesterday was finally a nice sunny day so we decided to head out to the park and test out some shade canopies we received from Quik Shade recently. 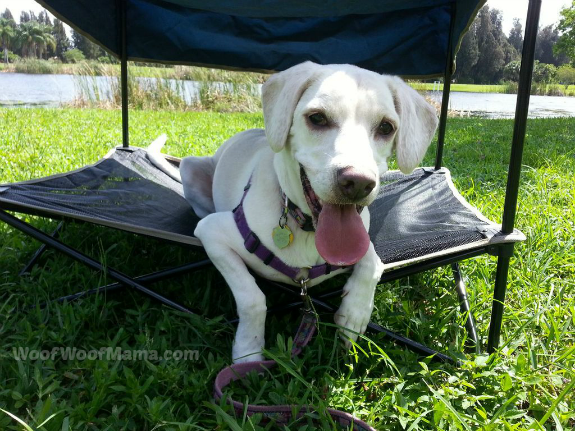 Quik Shade makes awesome instant canopy and chair sets for humans, and has also started making instant canopy pet beds that are super easy to carry, quick to set up and offer shade and comfy ventilation on a hot day. 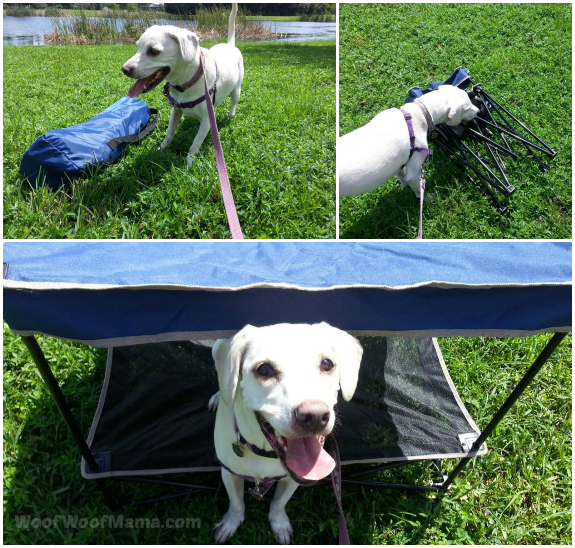 In addition to great features to keep Daisy cool and sheltered on a hot day, I also love that the canopy bed folds up into an easy to store and carry tote bag with shoulder strap. We don’t have much room for storage, but it fits perfectly in the closet and doesn’t take up much room in my car’s trunk either! With temps reaching the high 80’s and low 90’s already in many regions, we pet parents need to be careful to keep the fur kids cool and hydrated when out for a day at the park or beach. Pets can get easily overheated and dehydrated so it’s super great to have a handy instant canopy for her AND for us when we go for a family fun day. This pet canopy would also be perfect for hanging out together in the backyard or on the patio! Daisy isn’t the only one who needs shade on a hot, sunny day…luckily, Quik Shade also invited us to test out the instant canopy and chair combo set, too! The whole set fits in a handy backpack that takes up less than a foot of cubic space, and is super fast to set up and take down. The backpack is perfect for hand-free carrying, as you can Woof Woof Papa modeling it above for us. What I love about both the pet canopy and the Quik Shade combo set for people is that their portability makes it easy to get off the beaten path and find the perfect spot away from the crowds, and not be limited to where there are shade trees or picnic shelters…we just make our own shade wherever we want! We’ll definitely be taking these to the beach and out for plenty more fun summer picnics with Daisy and her pals! We received product samples so that we could try them out for ourselves and give you our honest opinions. We were not obligated to write a review nor were we told what to say. All opinions are 100% our own. 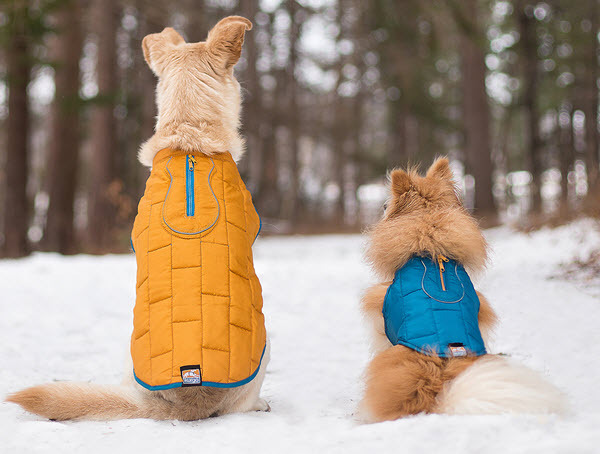 FAB Pet Deal on EzyDog Backpacks for Dogs – Up to $30 OFF! 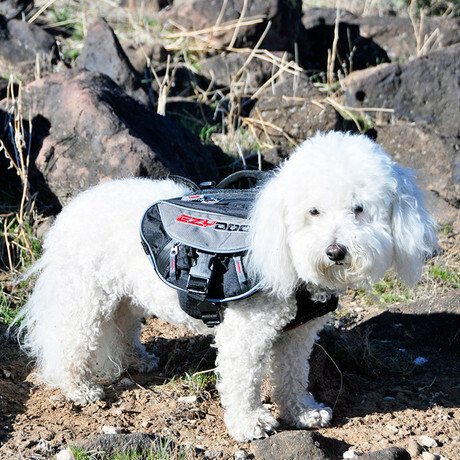 If you and your pup enjoy hikes, long walks or city outings, you will want to take a look at these EzyDog Backpacks while they are on sale for as much as 42% OFF during this week’s FAB.com pet sale! Select from Small to X-Large and your dog will carry their own water, toys and treats on your next adventure. They can even carry YOUR stuff if you are nice to them! Sale prices are $32-$54 ($54-$85 reg.) depending on size. Fab.com Pet Sales run weekly with new items added each Thursday evening. Dog Agility Starter Kit by Kyjen 42% OFF Plus Free Shipping! 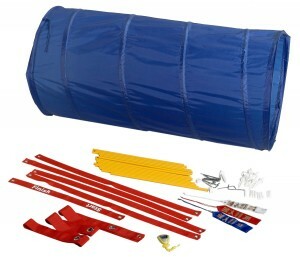 Just spotted this pet deal over at Amazon.com for 42% Off the Kyjen Dog Agility Starter Kit. Regular price is $69.99 but it’s on sale for $40 with Free Shipping. A few Amazon sellers have it for slightly less, but charge for shipping and I prefer to order deals that ship directly from Amazon.com when possible! The agility starter kit is for outdoor use and includes a 32-inch-wide high jump that adjusts to 34 inches high, an open tunnel that measures 24 by 24 by 48 inches, a 34-inch square pause box, and six weave poles that measure 36 inches high and are spaced 20 inches apart. Setup and usage instructions, game rules, a stopwatch, award ribbons, and a start and finish line, as well as a dog-agility training-tips booklet are also included. From reading the reviews, this sounds like a very fun kit for small and medium dogs, or for anyone just looking for a fun outdoor play set, but it’s obviously not professional agility equipment at this low price. We’ve always been happy with the quality and design of Kyjen Products! Visit Amazon.com for reviews and to order.